Looking carefully, the accompanying cup does not have any special structure, just like the water bowl and container connected together, no longer need to open the lid, no need to get another bowl of water. The overall design is very simple, but very clever: Just press the water outlet button and the drinking water will flow to the water feeder. Press the button for water by one key. This is a big selling point for PETKIT EVERSWEET's bottle. You can see that with this cup, we can hold the dog in one hand while the other hand can feed the water. One person can do it! In adittion, with PETKIT we can press the button for water, rotate the button to lock by the same key. In the process of driving, or under the situation of that the water is very scarce. We can not throw out the dog’s undrunk water. Then this function is very critical! 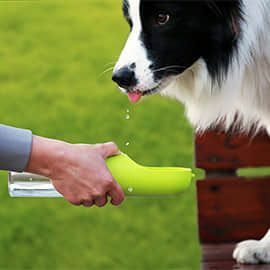 There has a little different from a regular cup, the water bowl section of PETKIT are made of the material which is non stick of water. Under the condition of normal temperature, just toss it will let it dry soon. So it will not wet the inside of your bag. Because it is an open sink and there is no dead angle design, cleaning is also very convenient. USD $21.99 $24.00 In Stock.